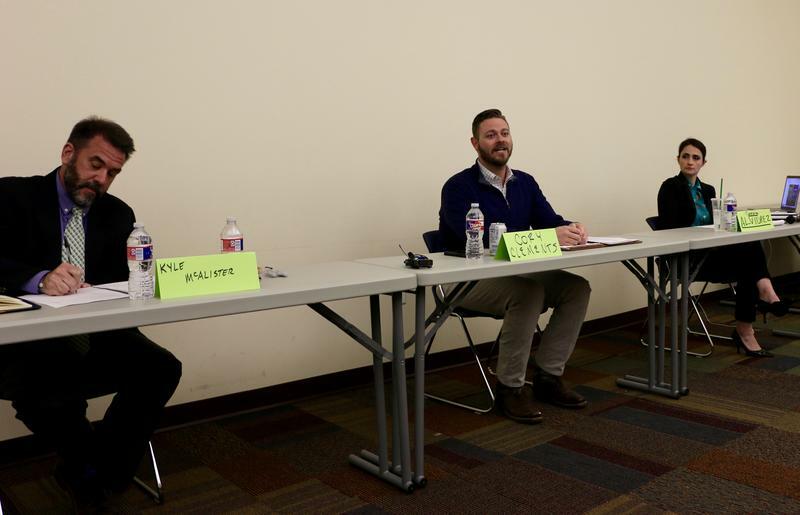 Abilene City Council Place 5 candidates Kyle McAlister, Cory Clements and Cynthia Alvidrez at the Hispanic Leadership Council forum. KACU's Matthew Thompson reports on the Hispanic Leadership Council's candidate forum for Place 5 candidates. One of the main focuses of the night was how to address public mistakes made by council members, referencing a recent resurfacing of Councilman McAlister’s controversial social media posts. Councilman McAlister’s decision to run for reelection has sparked backlash from some concerned groups. Challenger Cory Clements addressed these posts as a clear mistake, but said that these mistakes do not indicate an ominous agenda. Abilene voters will have a chance to hear from candidates for the open Place 6 seat, when the Hispanic Leadership Council hosts its next forum, Thursday, April 11th at the Mockingbird Lane branch of the Abilene Public Library. Voters will choose among the Place 5 and Place 6 candidates on the ballot for the May 4th election. Early voting begins April 22nd.